You Can Finally Change Your iPhone’s Carrier Logo Without Jailbreaking. Some carriers don’t appreciate the simplicity of the iPhone and iOS, and they slap big ugly carrier logos in the status bar that just look nasty. I use my iPhone 5 on Vodafone in the U.K., which is guilty of this very thing. Thankfully, there’s finally a way to change your iPhone’s carrier logo without jailbreaking. The ability to customize a carrier logo has been one of the advantages to jailbreaking for as long as I can remember. Without jailbreaking, however, it hasn’t been possible. That is until now. Developers Kevin Lo and Daniel Levi have created a new Mac application called CarrierEditor that allows you to quickly and easily change the carrier logo on almost any iPhone. Simply download the app, tell it which carrier version your iPhone is running (this is found in the About menu within general settings), and then feed it the image files that you’d like your new carrier logo to be. The app then puts together a new carrier settings file, which you can quickly send to your iPhone via iTunes — it takes seconds. Unfortunately, not all carriers are supported. Many are, but some — including Sprint in the U.S. — have been left out for unknown reasons. As long as your carrier is supported, however, you can use CarrierEditor — regardless of which iPhone you have. 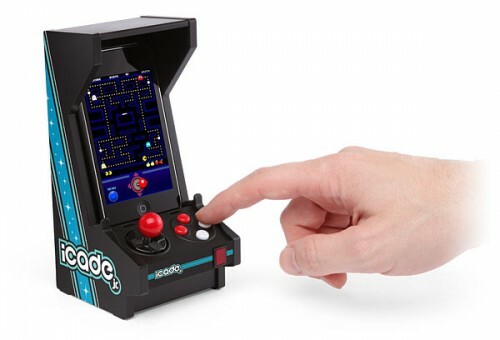 It even works on iPhone 5.
iCade Jr. Arcade Controller Discounted to $9.99. Daily iPhone App: Ring in the New Year with the Official Times Square Ball App. It’s New Year’s Eve, which means there will be a rocking party in Times Square tonight. If you can’t be in New York City for the shindig, you can still participate in the fun using the 2013 edition of the Times Square Official New Year’s Eve Ball App. The official New Year’s Eve app lets you watch a live stream of the events, including the midnight ball drop, from Times Square and even participate by submitting your own party photos. The top photos will be featured on the Toshiba Vision screen directly beneath the official crystal ball. The app also includes the history of the event as well as the news, photos and event schedule for the 2013 party. The Times Square Official New Year’s Eve Ball App – 2013 is available for free in the iOS App Store. Weekend iPad Wallpapers: Apple Logos. This weekend’s iPad wallpaper choices are from one of my favorite categories – Apple logos. Many of the iPad wallpapers that I’ve kept the longest on my home screens have been from this category. First up today is the pile of 3D sliver Apple logos on a deep blue background shown above. This one, and all the choices today, are from the Wallpapers HD for iPhone, iPod and iPad app by Stuck Pixel. There are a number of similarly named apps in the App Store so be sure to look for the one with that full title and published by Stuck Pixel. Here’s the App Store link for it. The Fall Trilogy – Chapter 2: Reconstruction for OS X now available. In the first chapter of The Fall Trilogy for OS X, you woke up with no memory in a mysterious temple, and had to make your escape. In the second chapter of The Fall Trilogy, you wake up in a skyscraper and have to find a USB key. Your goals are to find out more about your past and the mysterious voice that is guiding you. The Fall Trilogy is a point & click adventure game for OS X from the developers of Destination: Treasure Island, Secrets of Da Vinci, and Return to Mysterious Island. You explore and solve puzzles as you learn more about who you are and how to make your way to freedom. The Fall Trilogy needs a Mac with an Intel processor, 512 MB of memory, and running OS X 10.6, 10.7, or 10.8. You can download a demo for both The Fall Trilogy – Chapter 1: Separation and The Fall Trilogy – Chapter 2: Reconstruction from Coladia’s website, and purchase them for $9.90 each. BassNation introduces BlackBox audio system. 1.) I’ll take BassNation over Rhythm Nation any day of the week, but only because I’m a bigger fan of Chris Squire than I am of Janet Jackson. 2.) If I’m going to be playing my music through an audio system, it may as well be one that can survive a plane crash, right? BassNation Audio’s BlackBox is an all-wood audio speaker system aimed at music enthusiasts, but not quite at a music enthusiast price. The BlackBox comes with a built-in digital amplifier that turns any music source with an audio output jack into a loud and clear audio system with its simple plug and play set-up. This means no dock for your iPad, iPhone, or iPod touch, but you can connect them via their headphone jack. And, of course, it’s also compatible with other MP3 players, computers, gaming consoles/handhelds, and more. The Electronic Industry Association (EIA), recently reported TV Sound Bars and iPhone docking speakers are the hottest growth category in consumer audio with an estimated 30% annual growth rate. BlackBox fits both applications as it is flexible, compact, portable and can be used everywhere—from dorm rooms, studios, DJ’s, home theater and more! The BlackBox is available now for $295.00. For more information, visit www.bassnationaudio.com. Apple drops prices on refurbished Mac Minis by $50, now start at $469.